After my trail cameras took videos of two monster bucks on my property, I nicknamed him the "Devil Buck" because the night time trail cam videos had his eyes glowing and he had a devilish look to his antlers. I was very selective during archery season 2011 I passed up eight bucks, one of which stood 10 yards away for 15 minutes. None were more than 2 1/2 years old. I saw my buck near the end of archery season at about 55 yards away (too far for me). A neighbor ended up getting the other monster buck, but his rack had three broken points on it. The videos that I had of his buck in velvet made him a lot prettier. Turns out my buck was seen several times running with his, so we assume mine broke his all up. Opening day found me in a tree about 1/2 mile from where I got the videos of him but at the place I saw him during archery season. Fifteen minutes after first light I heard something running into my woods. I looked and saw a coyote that looked just like a Timber Wolf and a reddish Coyote with him. As badly as I wanted to shorten their lifespan I didn't want to ruin my spot by shooting so early. I hadn't checked my camera in about two weeks and was dying to see the vids, so I climbed out of my stand and went to the camera and watched the videos on the screen. Nothing to write home about on them so I went back to my tree. I was in it for about 45 minutes and looked down through my woods and there he was at about 55 yards (the same place that I saw him during archery season)!! This time I had my scoped Remington 1100 with me and the distance was just right. I dropped him where he stood. I got lucky that by checking my camera earlier I almost blew it!! When I first shot him I didn't know it was him. I just knew he was a good one. When I got to him I realized I killed the Devil Buck and radioed my brother.I must have said, "Oh my God." about fifty times before my brother came to assist me. The buck dressed out at 199 lbs. Green scored 154 5/8" and has 6 5/8" and 6 3/8" bases!! 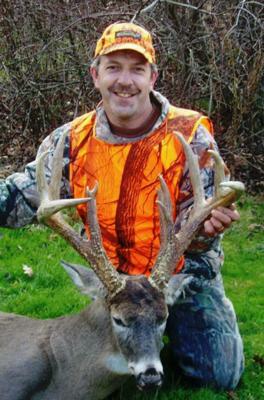 He has an 8-point frame with two stickers off his brow tines. He is my best buck (antlerwise)out of about 35 bucks I've taken in 37 years of hunting deer. My heaviest deer I took last year with a bow , a 6-point, dressed at 208 lbs. Each deer provided about 100 lbs. of boneless meat.